Just a quick one to say congratulations to aaronhicks uk (Noak) for winning week 2 with a monster score of 14,028,610. Well done on being the Centaur master! Yep great score. I knew before I went on my mates stag to riga that I would be overtaken but that score was amazing. Hopefully I will do better this week! Thanks for the grats on my Centaur score. I had a go on the Space Shuttle last night and I quite like it as a table, it does seem to like draining down the right outlane mind. Looks like I've got a bit of work to do now though, a couple of you have put up some really good scores already! We did MM already so CV for me please! I vote for CV too. Haven't had a chance to play the last couple of days as I've been really busy at work. Pretty pleased with my last game this evening though, managed to get it singing for a bit and raised the bar to 6,376,120. How many balls do you reckon you lose down the right outlane!? Yup the right outlane is an absolute pain, I often find I lose it when the ball comes flying out the bumpers at mach 10, and because of the physics of the game it just goes flying down there with no friction or a chance to save it. Sometimes the ball seems to hit outlanes at a perfect trajectory as if there is no obstacles in the way and it disappears before you even realise what is happening! I guess CV is our next game! Uh oh. Lights Camera Action! Just updated the spreadsheet for Space Shuttle - congrats to aaronhicks uk (Noak) for his win. Cirqus Voltaire is next I think. Hmmm... from the current leader boards looks like I'm in even bigger trouble than usual on this one. Nice one dude, I generally don't do very well at CV either! I hate the outlanes, although not as bad as STTNG . I found you definitely needed to keep the airlock open on that one to be able to achieve a good ball time and in turn a high score. Quite enjoying what I've played of Circus Voltaire so far, nice to be playing a modern DMD table this week for a change. I've made and invited you all to a Pinball Info steam group which should help other players who may join in the future find us without having to search for everybody one by one. Whats up for next week? May I nominate White Water, Taxi and Theature of Magic as three possible candidates? I would like to Vito TOM as I have played it a lot recently trying to get the grand finale. It took me about 2 weeks and drove me insane. I now kind of hate the table due to overdose. The other 2 I'm fine with so whatever really! Haven't had that on TZ , have to try and see if I can replicate it for you. I will put my vote in for White Water! Woo spooky magic floating rubbers! I'll vote White Water for next week, haven't played it for ages and like it so much I want to buy a real one at some point. I don't really play Twilight Zone on Pinball Arcade anymore as I've got a real one but can remember it having a fair few bugs when I did. Its well annoying when you're on to a good score and then something like that happens. I see from that screen shot that then have corrected the art on the slingshots, somehow they managed to get the art on each one reversed. 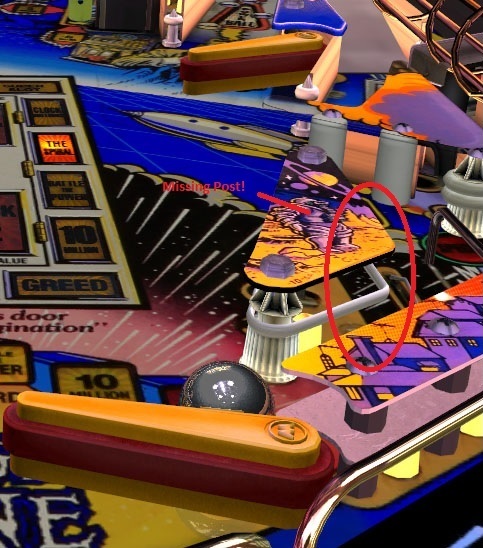 I used to think Pinball Arcade was a pretty realisic simulation but after playing a real table it makes you realise the ball physics are still a long way off. Its definitely a lot easier to put up silly score and make repeatable shots that in reality just wouldn't go due to spin on the ball etc. Still fun to play mind and its been instrumental in helping me to decide which tables to buy and learning rulesets etc. Nice scores building up on CV guys, the finish should be interesting. I see I've slipped back to my usual place My ambition is to come third just once! But not this time - I had one good game but overall I'm finding CV worse than Space Shuttle for sudden drains, and although I have been really enjoying the table, the audio is starting to irritate me. Looking forward to White Water, never played it before. We've definitely been putting some pretty good scores up between us on the tables we have played so far, competing with top 10 scores worldwide on the week. The area between the inlanes/outlanes on CV is pretty open so the best thing to do is try and avoid the ball going there full stop with gentle nudges, easier said than done at times mind! White Water is an awesome table and one of my favourites, so definitely looking to getting sometime on it next week. Best of luck to all for the finish of CV . Yea Party Multiball is a big scorer for sure. I don't think I've had a game where I've maxamised my opportunites for big points yet though, I'm draining multiballs way too quickly. My best score to date should of been higher than it was really as I tilted the table on a really good ball and lost what would of been a pretty meaty bonus. The worst bit about CV is unmasking Voltaire which is step 2 to joining the circus (I think). I got to that stage without dropping a ball last night then lost 2 on that 1 step. Ended up with a poultry 77mil. ARGGGHHHHH!! And when u drop a ball and that stupid woman says "LETS REVIEW YOUR CIRCUS ABILITY" I just want to put my fist through the screen. In short bring on white water!! Cos this is doing my nut. Is there any chance we could have this thread stickied? I suppose we would need to message one of the admin guys right?